You know the type. You pick up book one and think, Cool concept, I’ll buy it, and suddenly you’ve committed yourself to dozens upon dozens of books in the series you randomly decided to give a try. 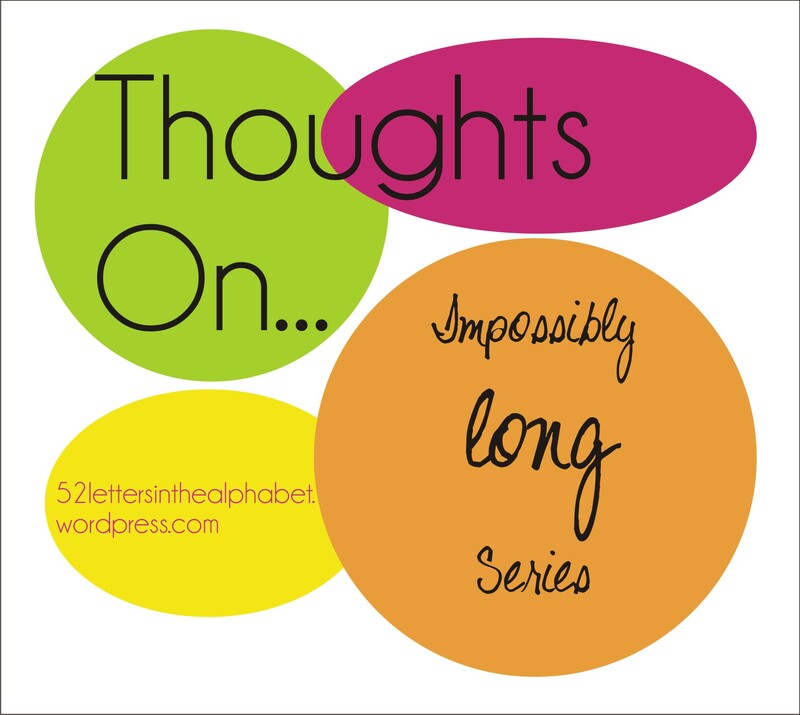 For this post, I’m defining impossibly long as more than five books, because I feel like at that point you have to be seriously dedicated to the series to stick with it. I honestly can’t decide how I feel about these series. Usually, they annoy the heck out of me. But sometimes they work, and then I’m thankful that I get to spend so many books with great characters and plots. The House of Night series by P. C. and Kristen Cast didn’t work for me. I really liked it in the beginning but by the fifth or sixth book there was just too much going on. The plot’s focus kept having to change to keep the series going, to the point that book one and book nine (which is the last one I read, I think) had basically nothing in common. The romance got waaaay too complicated. Love interests and conflicts just kept being added to keep the series going, but it got old. I gave up on the series nine books in, but I probably would have earlier if I hadn’t already bought the later books. Juxtaposed with that series is the Stephanie Plum series by Janet Evanovich. I’ve posted a ton of reviews for this series, and it’s obvious that I’m loving them. I think what makes this crazy-long series works (it’s over twenty books long, and it’s not over) is that each book has a self-contained plot and there are only a few larger plot lines (the romance, her family) that carry over throughout the series. This way, you don’t have to remember every detail of the previous books’ plots to go back to reading the series, which means you can take breaks to read other things. Also, the tone of the series never takes a dramatic turn from where it began, so I have faith that when I pick up the next book in the series, I’ll enjoy it as much as I have previous books, which keeps me coming back. Somewhere in the middle are shorter series. Vampire Academy by Richelle Mead and the Gallagher Girl series by Ally Carter both have six books, and both are on my Top Shelf. Though both definitely changed over the course of the series, the change felt natural and in character, instead of a desperate effort to lengthen the series. With both, I could tell (or at least it seemed like) the authors had planned out the series from the beginning, and could therefore write a longer series without sacrificing the sanctity of their plots. These days, if I know a book is part of a long series, I am less likely to pick it up. Part of this is because I’ve read some long series that were made bad by their length and I don’t want to commit myself to a doomed relationship. The other part is I don’t have much time to read these days, and I have a ton of books I want to read, and I don’t want to spend weeks reading the same series (especially if it ends up being bad). What about you guys? Do you like long series? Do you despise them? Have you read any of the series I’ve discussed? I tend to have a strange love affair with series in general. I read a lot of them, but I try to wait and read them when they have ended so I can just sit down and read them from beginning to end. I have difficulty dealing with the in between time where I finished book A-D in the series but book E won’t be released for another year. I have had some memorable affairs with long series The Dark Tower by Stephen King is now 8 novels and I am in love with it. I am also going to be delving into The Wheel of Time Series by Robert Jordan and Brandon Sanderson which is a total of 14 books not including the novellas (I think it isn’t including the novellas). I have also experienced some negative ones, for instance I love the premise of Sherrilyn Kenyon’s Dark Hunter novels but there tends to be so much overlap between it and her other series that I sometimes find myself frustrated. I think I have read 20 of those now and have 2 or 3 newer ones I haven’t read yet and may not – I may just give up on it there, I don’t really know. Glad you liked my post 🙂 I definitely do the same thing and try to wait until a series over until I read it. I have this weird thing where if the next book in a series comes out, I HAVE TO read the whole series again, which means there are some series that I’ve read the first book upwards of half a dozen times. It’s easier if I can read it straight through. Sometimes I like long series, sometimes I despise them! I’ve read the Gallagher Girls series by Ally Carter and I desperately want to read Vampire Academy by Richelle Mead since everyone (maybe not everyone) says its really good! I love long series! As long as the writing stays good. I tend to wait until the series has been out for a while to jump in though.